"Used UREI Small Knob With Line, 1/8"" shaft size"
"Used UREI Small Knob, 1/8"" shaft size"
For sale is a lot of TWO new old stock Clarostat 1/8�۝ shaft 1/4�۝ bushing 10K audio taper pots. NOS A-B Cermet 1/8 shaft 1/4" Bushing Cermet 25K Reverse Audio Taper Pot. 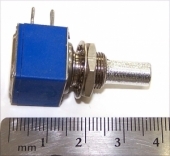 "New A-B 500K Audio (Log) Taper 1/4"" Bushing 1/8"" Shaft Potentiometer"
"New Bourns 500K 1/8"" Audio Taper Pot Potentiometer"
"NOS A-B Cermet 1/8"" shaft 1/4"" Bushing Cermet Audio Taper Pot"
A-B Type K 1/4�۝ Shaft 3/8�۝ Bushing Dual 1K Audio Taper Pot. New old stock A-B (Allen-Bradley) 10K 2 watt military grade sealed audio taper pot. Unused new old stock 5 megohm ���release�۝ pot for all UREI and UA models of the 1176LN, made by Centralab. USED dbx PC mount 20K pot for model 160, 161, 162, etc. NOS Sfernice 22K Audio / Log Pot, 4mm Shaft, 6mm Bushing, For Focusrite Products Etc. 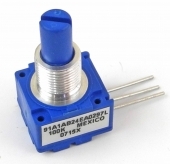 Lot Of TEN New E-Switch 5511M1X EG1709-ND Pushbutton SPDT Key Switches. New Prem Dual 22K Linear Pot, with 85mm Long, 4mm diameter shaft. 6mm threaded bushing, 5mm long. New Prem 10K Linear Pot, with 82mm Long Shaft. 6mm threaded bushing, 4mm shaft diameter. 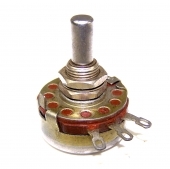 NOS Sfernice 47K Audio / Log Quad Pot, 4mm Shaft, 6mm Bushing, For Focusrite Products Etc. Used Alps Quad 4-Gang Stepped 10K Audio Taper Pot For Monitor Level, Etc. New 100K Detented Reverse Log Taper Pot, Short 4mm Shaft. 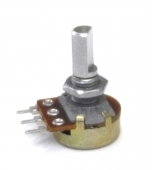 New Bourns 100K Plastic Conductive Reverse Log (Audio) Potentiometer, P/N 91AAB24EA0297L. "7 Clarostat Dual 10K Lin + Single 5K Lin Plastic Conductive Pots, 1/8"" Shaft. 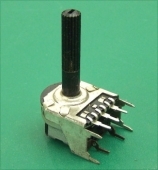 PD"
"7 Clarostat Dual 10K Linear + Single 5K Linear Plastic Conductive Pots, 1/8"" Shaft. Total of 3 sections. " Dual 100k Audio Taper Pot, 7mm Bushing, 6mm Spline Shaft. Includes mounting nut. 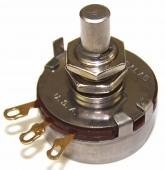 "New in box NOS 500 Ohm Linear Taper 2w Clarostat RV4NAYSK501A 1/4"" Potentiometer. " NOS Clarostat 100k Reverse Log Miniature Pot 1/8" Shaft 1/4" Bushing. Conductive plastic element. 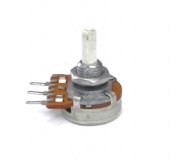 New Radiohm 22K Audio Taper Pot with Switch for Drawmer gear, etc. New Omeg 22K Center Detend Linear Taper Pot, 4MM" Shaft. New Alps Dual 2-Gang Stereo Stepped 10K Audio Taper Pot For Monitor Level, Etc. Includes mounting hardware. USED original dbx dual concentric 20K pot for 900 series modules. New Radiohm 22K Linear Pot w/Push Pull SPDT Switch For Aux & Cue Sends, Etc. 4mm Shaft 6mm Bushing. 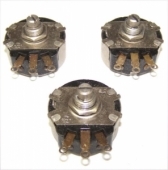 "New Clarostat Plastic Conductive Dual 5K Audio (Log) Taper Pot, 1/4"" Bushing 1/8"" Shaft." Lot Of TWO NOS Unused A-B Type J 2.2K Linear Taper 2 Watt Potentiometers. 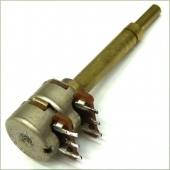 New Radiohm 22K Center Detend Linear Taper Pot, 4MM" Shaft. A-B WA2L040S105UC 1 Meg Linear Cermet Screwdriver Adjust Miniature Pot. Short screwdriver adjust shaft, 3/8" threaded bushing. Includes 2 hex nuts. New Dual Concentric 4-Gang 50K Reverse Log Pot, 6mm Threaded Bushing. 3 New Radiohm 47K Reverse Audio (log) taper PC Mount Pot for Drawmer outboard gear, etc. 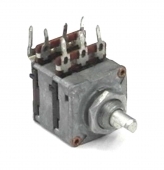 Clarostat Dual 5K Linear Center Detent Plastic Conductive Pot. New Radiohm Dual 100K Linear Pot, 4mm Shaft 6mm Bushing. New A-B WA2L040S105UC 1 Meg Linear Cermet Screwdriver Adjust Miniature Pot. Short screwdriver adjust shaft, 3/8" threaded bushing. Includes hex nut. New 5K Reverse Log Pot, 6mm D Shaft. 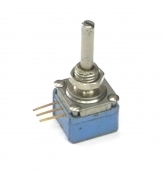 New Piher 10K Audio Log Taper Potentiometer, 4mm Shaft, 6mm Bushing. NOS Clarostat 500 Ohm Linear Taper Plastic Conductive Pot, 1/8" Shaft. 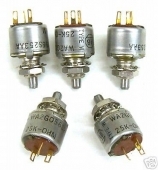 "1K Bourns Audio Taper Cond Plastic Pot, UREI 1176LN etc adapted 1/4"" shaft PB"
For sale is a lot of FIVE new old stock Allen Bradley 1/8�۝ shaft 1/4�۝ bushing 25K Cermet audio taper (log taper) pots. NOS Sfernice 5K Center Detented Linear Pot, 4mm Shaft, 6mm Bushing, For Focusrite Products Etc. New 10K Detented Log Audio Taper Pot, Short 4mm Shaft. 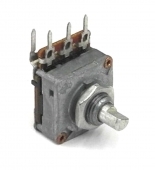 New Mackie 130-044-02 10K Reverse Log Potentiometer. 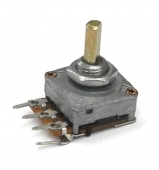 New Mackie 130-044-042 10K Reverse Log Potentiometer.